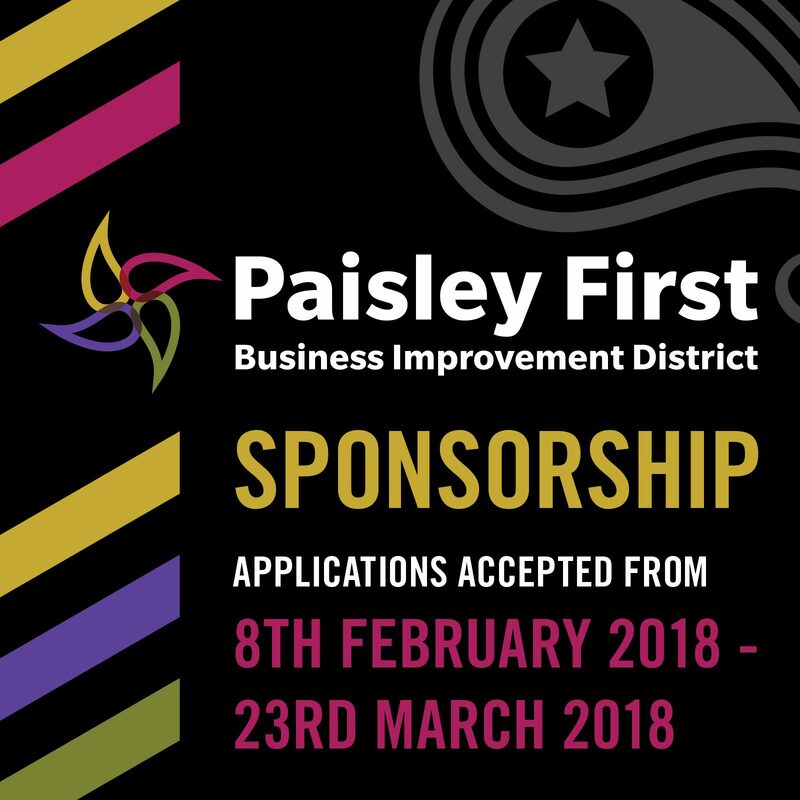 Applications for Paisley First Sponsorship Open Now! Have a great idea for an event or project that will encourage visitors to Paisley? Then Paisley First wants to hear from you… applications for sponsorship are open now! Paisley First is committed to improving Paisley town centre by increasing footfall to the town and maximising business opportunities for Paisley First BID Levy Payers. They are aiming to promote Paisley as a visitor destination by making customers think of Paisley as the go-to place for their shopping, dining and entertainment and leisure needs, providing great experiences for visitors to the town. Applications for sponsorship are being accepted from organisations who feel that their project or event would help support the achievement of these objectives by attracting additional footfall to Paisley town centre. If you have any queries or require any further information then please contact the Paisley First team on 0141 237 8120 or email ask@paisleyfirst.com . A second round of applications for Paisley First Sponsorship Opportunities will open again later this summer. https://i1.wp.com/www.paisley.org.uk/wp-content/uploads/2018/02/Spring-Paisley-First-Sponsorship-Web-Graphics-07-02-18-x2-1.jpg?fit=1600%2C1600&ssl=1 1600 1600 Brian McGuire https://www.paisley.org.uk/wp-content/uploads/2015/09/paisley-logo-trans.png Brian McGuire2018-02-23 14:06:262018-02-23 14:18:40Applications for Paisley First Sponsorship Open Now!